The movie 'FactoryGirl' comes out 2/2/07, based on this book. 'Factory Girl' is set in 1965, the year Edie Sedgwick (Sienna Miller) met Andy Warhol (Guy Pierce) and became known as his muse. 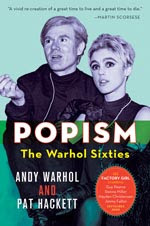 The film chronicles her time as New York's "it girl" to her falling out with Warhol to her untimely death from a barbiturate overdose in 1971 at the age of 28.